While Final Fantasy Type-0 HD isn't due out in North America until Tuesday, a special ending cinematic teaser from the end of the game has hit YouTube, suggesting game director Hajime Tabata's desire to make Final Fantasy Type-1 is being realized. While the ending cutscene, currently available on YouTube (via NeoGAF), does not specifically mention the name Final Fantasy Type-1, Tabata's comments to Kotaku last year about wishing to continue the experimental branch of the Final Fantasy universe once done with work on Final Fantasy XV, coupled with the content of the cutscene itself (no spoilers), is a strong nod in that direction. 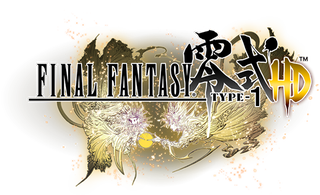 Having yet to experience Final Fantasy Type-0, I've no idea if this is exciting or not, but I was at least stirred enough to badly mock up a logo.